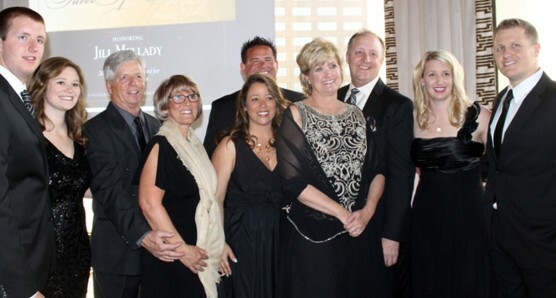 Jill Mellady, president of Valencia-based Mellady Direct Marketing, received the Silver Spur Award for Community Service from the College of the Canyons Foundation at a black-tie gala dinner Saturday night at the Universal City Sheraton Hotel. 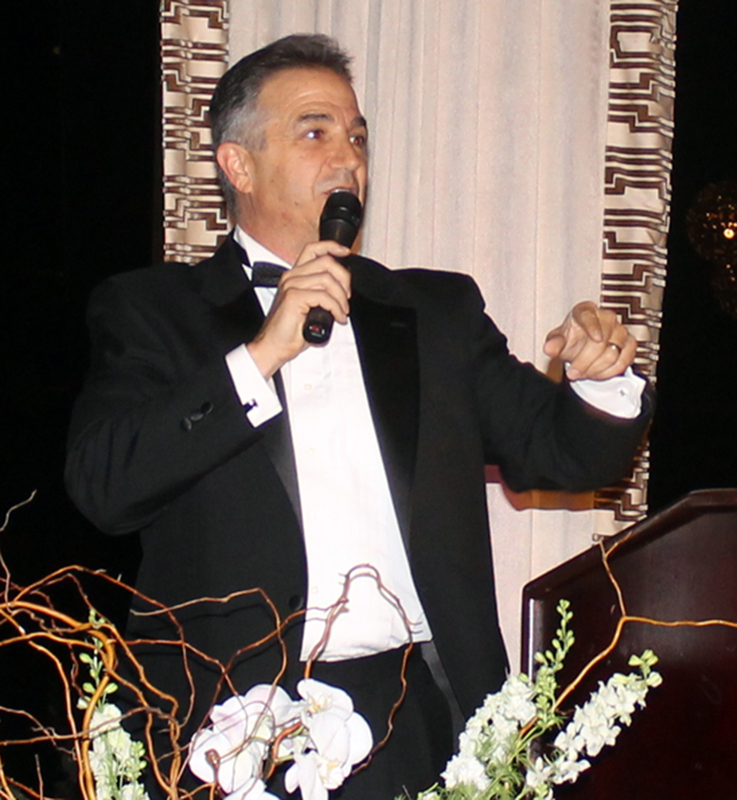 The event, which included a live auction fundraiser for programs at COC, was emceed by gala chairman Randy Moberg and COC Foundation member Anna Frutos-Sanchez. "It is heartwarming and humbling to be honored for my service to the Santa Clarita Valley," Mellady said. "Santa Clarita is a wonderful place to live because so many contribute to the nonprofit organizations and the business community." Mellady, who started her company as a home-based business in 1986, credited COC with much of her success. "College of the Canyons gave me the leadership skills and understanding of how to run my business. I want to give back to them as much as I can so I can help others succeed," she said. Mellady's husband, Jim, and children, Stephanie and Brendan, also attended the celebration gala. "It's for the kids," said Chris Fall, who served as auctioneer. His good humor kept friendly bidding wars in play and saw prices escalate in the 10-item auction. Supporters even bid up a $2,500 Princess cruise certificate beyond its value, to a final price of $2,800. The live auction netted $18,200 for the COC Foundation, including $4,000 for two pizza parties for 10 that will exclusively benefit COC's Institute for Culinary Education. 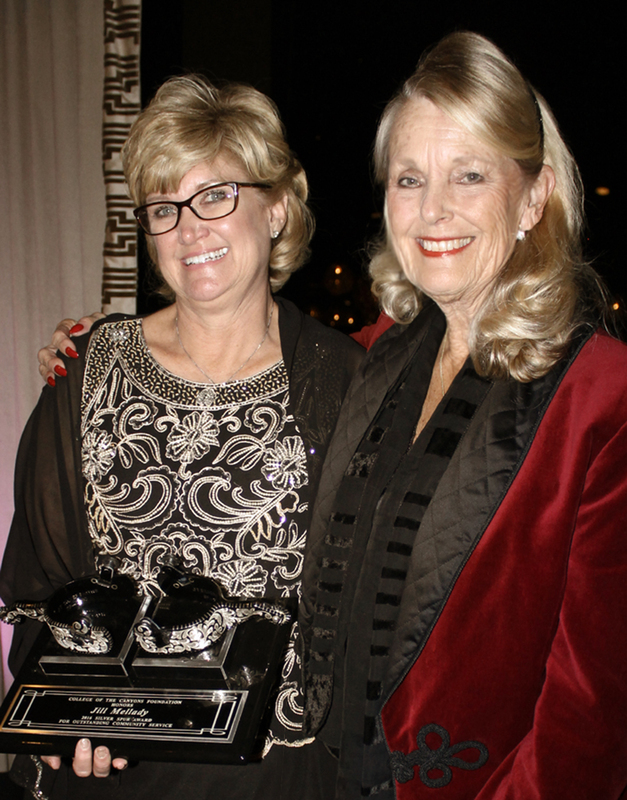 College Chancellor Dianne G. Van Hook presented the Silver Spur Award to Mellady, who has worked tirelessly for many Santa Clarita Valley nonprofits including College of the Canyons. Mellady earned an associate degree in business administration from COC in 1991 and has served on the college foundation board since 2004, including three terms as president. She also has chaired the COC President's Circle and served on the Measure M Citizens Oversight Committee. Mellady has been named COC Alumna of the Year and was inducted into COC's Hall of Fame. In addition to her support of COC, Mellady is a founding member of the SCV Economic Development Corp. and serves on the board of the SCV Sheriff's Foundation and the executive board of the Valley Industry Association. Mellady previously served on the boards of the Child and Family Center, Michael Hoefflin Foundation for Children's Cancer, the National Association of Women Business Owners, the SCV Repertory Theatre and the United Way SCV Advisory Board. She also founded the Nonprofit Leadership Committee and SCV Legacy Giving. Mellady was named Volunteer of the Year by the Michael Hoefflin Foundation and was nominated by COC, the Michael Hoefflin Foundation and the Child and Family Center for SCV Woman of the Year. Van Hook remembered handing Mellady her diploma while Mellady carried her young daughter on stage. "When I think about Jill and what she has accomplished, I am reminded of that famous quote which points to four actions that lead to excellence: risking more, caring more, dreaming more and expecting more," Van Hook said. "Jill embodies all of those, and because she does, we are here tonight to honor her achievements and her successes. "More importantly we are here to thank her," Van Hook said. "Many of us here owe Jill a debt of gratitude for all she has accomplished — and helped us accomplish, as well." Mellady received a standing ovation as she held back tears and walked on stage to receive her new set of spurs. "It has been so rewarding to work with members of nonprofit organizations and business organizations to serve the Santa Clarita Valley," she said. She paid homage to her husband, to Van Hook, and to friends and family during her short acceptance speech. A video biography of Mellady's life, from her birth in the Antelope Valley to her current business success, was also shown during the event. The band Blue Sky performed during the cocktail hour leading up to the award ceremone and afterward at the post-event dance. Bruce Fortine, president of the COC Board of Trustees, thanked the audience for the support he and his family received after the recent death of his daughter, Kathy Fortine. Kathy Fortine was a producer of ABC's "Jimmy Kimmel Live!" television show. Two scholarships at College of the Canyons have been established in her honor, one for music and one for television. Her father announced Saturday night that host Jimmy Kimmel has made a personal donation of $25,000 to the scholarships. The 2016 Silver Spur event committee included: Randy Moberg, Elise Lentini, Brian Koegle, Jasmine Foster, Barry Gribbons, Eric Harnish, Cindy Biehahn, Michele Edmonson and Murray Wood. For more information about College of the Canyons and the COC Foundation, visit www.canyons.edu.